A meticulously detailed cultural and architectural history of the Throne Room in Dublin Castle – a touchstone of British authority and Irish autonomy that can be analysed through the details of its form and furnishing. Categories: Art, 20th Century History, 19th Century History, 18th Century History. The Throne Room at Dublin Castle was the ultimate focus of viceregal ceremony, royal visits and many great state occasions both before and after Irish independence in 1922 – a touchstone of British authority and Irish autonomy that can be analysed through the details of its form and furnishing. Making Majesty is an elegant collection of essays, by leading Irish art and architectural historians, that covers a broad range of perspectives, which help to enhance our understanding of this lavish and highly significant historical space, shedding new light on the major and minor figures who created, ornamented, decorated and made use of it. 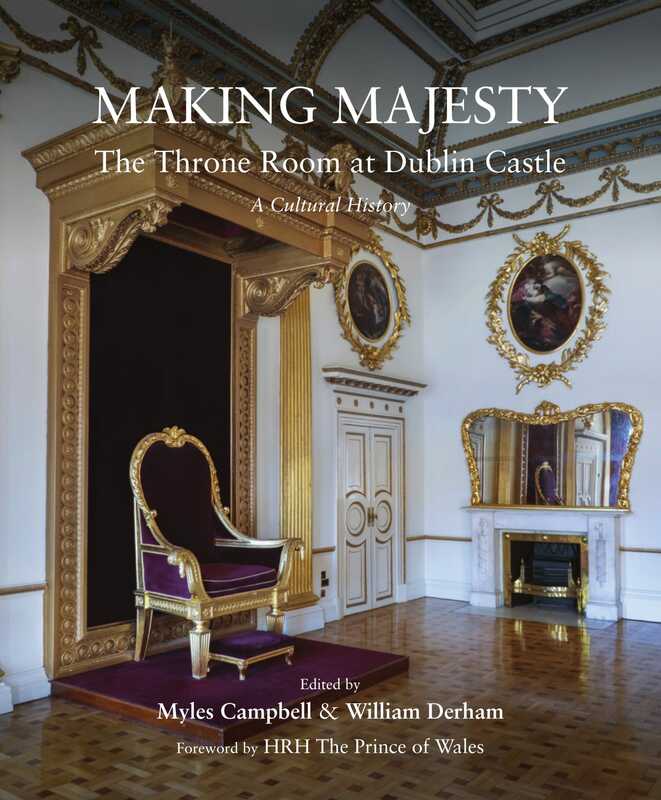 The first output of an ongoing programme of research into the cultural history of the State Apartments at Dublin Castle, Making Majesty presents original findings that offer a new reading of the nature and presence of the British monarchy and the viceregal court in Ireland. With insightful analysis that draws upon uniquely accessed archives, the contributors bring to light every aspect of how Dublin Castle’s authorities wished to be perceived and how that changed according to the whims of imperious viceroys, renowned craftsmen, and an Irish state wishing to secure an image of its newfound self-determination. Myles Campbell works for the Office of Public Works at Dublin Castle in the recently established Collections, Research and Interpretation Office. He is co-editor of The Chapel Royal, Dublin Castle: An Architectural History (2015) and has contributed peer-reviewed articles and chapters to books by various academic publishers. His work on Making Majesty has earned him the inaugural George B. Clarke Prize. William Derham works for the Office of Public Works at Dublin Castle in the recently established Collections, Research and Interpretation Office. He is co-editor of The Chapel Royal, Dublin Castle: An Architectural History (2015) and is author of Lost Ireland: 1860–1960 (2016).